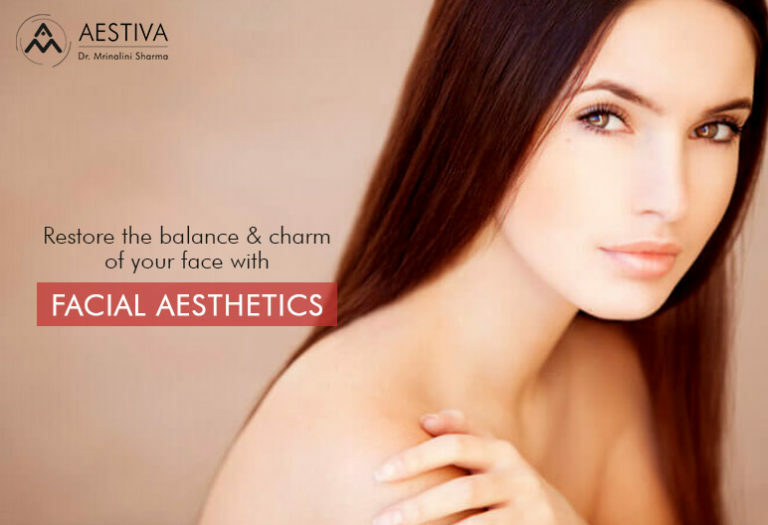 An array of procedures are available today which help sculpting different parts of the body including face. The term Facial aesthetics is used to refer to a number of treatments which gives you a younger looking skin and restores your facial appearance. These treatments are mostly used for a cosmetic purpose such as to define the contours of the face or to restore the balance. So, let’s talk about these treatments one by one. One of the most common areas to be addressed so as to improve the facial aesthetics is that of the lips. You want a fuller lip, easily done! Hyaluronic acid fillers (also commonly known as soft tissue fillers) can provide the desired shape and volume to the lips. Again, if you are unhappy with the thick lip it can be reduced surgically with lip reduction treatment. Another procedure very commonly in demand is that of dimple creation. Don’t worry if God has not gifted you with a natural dimple. In a short-sweet procedure of about thirty minutes, done under the local anesthesia, you can have the dimple you desire and get ready to flash a broad and beautiful smile. This is done for correction of chubby cheeks and removes a pad of fat just under your cheekbones, gives you that hollowed-out look and a chiseled appearance. Square jaw lines can be addressed by the use of corrective osteotomies and the desired V-line can be achieved. If you have a weak jaw bone with the use of implants you can get a strong masculine jaw. An over protruding chin can also be corrected by the use of surgical osteotomies which reshape the chin. If you have a weak chin then a chin implant is the treatment done under local anesthesia using an incision which is inside the mouth and is not visible. All these techniques are usually performed under local or general anesthesia. These procedures involve a lot of bruising and swelling which can remain up to a week, desired results, therefore, take at least one week to be visible. We have to remember that all these techniques need to be used judiciously so that a look is created which is in tune with the ethnicity of the patient. Also minimizing infection is a vital importance in all facial plastic surgery procedures. If you want to have a younger looking skin and want to restore your facial appearance then facial aesthetics is your answer to all your problems. For any further queries, you can drop us a query at info@aestivaclinic.com and we will be happy to answer your questions.